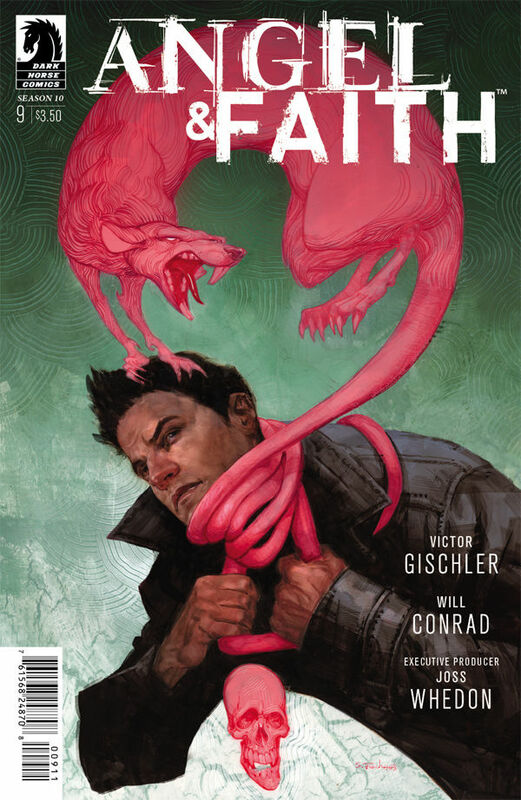 It seems like Faith’s storyline is destined to always be separate, while Angel’s storyline is starting to tie into the Buffy comic. I guess one out of two isn’t bad, right? Onward to some drama and excitement, I hope. 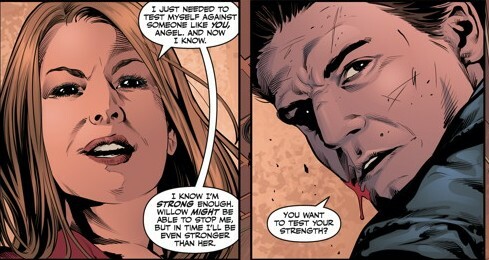 We start the issue with Angel still getting tossed around by Amy, and she’s got some serious power behind her. He really should have learned by now that making the witch mad is not the best course of action. But Angel does what he wants, without thought to consequences sometimes, and then angsts about it for years afterward. Fun times. They continue their fighting, and Jar!Warren almost gets broken, but Angel manages to catch it before it shatters. With the vampire having the upper hand, he threatens to drop Warren if she keeps up this fight. Before he makes good on his threat, though, he turns and runs away, with Warren’s jar tucked safely under his arm. Not a good move, I feel. This is just going to make Amy madder. 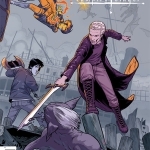 With a stopover to talk with Brandt and a little interrogation with Perry, who admits that he was going to use the Hellhound blood to track Angel, the vampire tells Perry to pass on a message to his boss. Angel wants to have Amy meet him at the old warehouse at midnight and implies he will hand over the Warren jar if Amy agrees to leave town. The both of them are full of secrets and double-cross, you know. When Amy meets Angel that night, she says that she will kill Angel, take over Magic Town, resurrect Warren, and when the time is right she will end Willow, too. She’s got big plans! But she underestimated Angel a bit, because not only does he have the cops there as protection, he’s got a Najakot demon along for back-up. A big spider that eats magic? That sounds like a recipe for trouble. We will have to wait to see how that all plays out. Meanwhile, we’re back to Faith in the jungle. She gets Sam to stay up on the ridge as their sniper cover and then takes Mai down with her to try and stage a rescue mission for the prisoners. They do achieve what they set out to do, and that was get the captured men out of the village and on the run to safety. Riley reunites with his wife and they continue their journey through the jungle to escape the vamps, and head off to the river where it is sure to be safer. All seems to be going okay, until the twist ending. Reese, it seems, has now turned into a vampire. What’s going on? We won’t know until next month, but it was a nice cliff-hanger to leave us on. 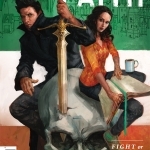 If only somehow Faith and Angel’s stories would intersect, but alas we can’t have everything…yet.